Before the first sketches were put to paper for the facility that would become Ronald Reagan UCLA Medical Center, it was clear to the planners that any new hospital bearing the name of one of the world’s leading healthcare brands would require the latest state-of-the-art technology. The new building that opened in June does not disappoint. 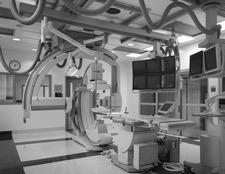 In addition to the standard (though most-up-to-date) operating-room equipment, the hospital’s 23 ORs are equipped with advanced audio and high-resolution video-conferencing capabilities, so that medical students at home or colleagues around the world can observe surgeries in real time; a cardiac-catheterization suite has equipment to enable physicians to perform magnetic-guided catheterization from inside the blood vessel; an MRI with a 3.0 Tesla magnet – twice as large as what existed until only recently – allows UCLA radiologists to do imaging tests in far-greater detail than they ever have before; a wireless network gives immediate access to medical reports, lab results, clinical imaging and patient vital signs; and the building’s complex and redundant infrastructure enables it to be self-sustaining for 72 hours after a catastrophic event such as a large earthquake. All this comes with a cost, of course, and it’s not just monetary. Constructing a state-of-the-art hospital means having to confront enormous challenges, not the least of which is keeping up with the rapidly advancing fields of medical and information technology. “On a project of this scale, it takes time to get the drawings done and get it built, and while you’re doing that, a lot of the technology that you were planning on is becoming obsolete,” says Richard Azar, the director of transition planning. Half-a-dozen major remodeling projects and two-dozen minor ones – all stemming from needs to adapt to changes in technology – were identified for the building while it was under construction. Although it’s difficult to quantify the extent to which concessions to medical advances contributed to the delays in completing the hospital, which originally was slated to open in 2004, they certainly were a factor. As much as possible, the planning team tried to wait until the last-possible moment to make decisions about technology. Take, for example, the wireless-network infrastructure that was installed throughout the building. “At the start of the project, there wasn’t even 802.11b,” says Dr. Atkinson, referring to the first widely accepted wireless-networking standard. As the standards evolved and new generations came and went, Dr. Atkinson’s group sought to buy as much time as it could to get the very-latest networking standard available. “The contractor starts to close off the ceilings [where the cabling is located], and you begin to get nervous because you still haven’t decided what your wireless network is,” he says. And in the case of bulky and heavy equipment, specific types of construction were required to provide adequate support and meet seismic-safety standards. The equipment also had unique power, cooling and data requirements, all of which could change when the manufacturer updated the machinery. Thus, as equipment evolved during the course of the project, so did construction requirements in the areas affected such as diagnostic and interventional radiology, cardiac catheterization and surgery. “They told us they were no longer producing the magnet we had ordered,” recalls Dr. Atkinson. “They wanted us to buy a newer model of the magnet – which, by the way, would weigh 4,000-to-5,000 pounds and require five-times the cooling capacity.” And there was one other not-so-minor hitch: The magnet was 10 inches wider than the one they’d planned for, meaning that the carefully mapped-out path to hoist the behemoth instrument into the building through a removable exterior panel was no longer operable. The new model was too wide to fit through the allotted space. To accept the bigger magnet would have required a major construction project to modify the nearly completed suite – additional structural steel would have to be added, as well as more electrical, shielding and cooling capacity. In this case, adapting construction to the demands of the technology was deemed impractical, and the decision was made to stick with the original purchase. “We told the manufacturer that we wanted the magnet we had originally ordered,” Azar says. “When they told us it was no longer manufactured or available, we told them to find us one.” As it turned out, the magnet they needed was available very nearby, at the UCLA Brain Mapping Center. Ronald Reagan UCLA Medical Center got that magnet, which was refurbished by the manufacturer and warrantied as new, for its MRI, and the Brain Mapping Center received the larger model. Or, consider a more low-tech example of how technology sometimes got ahead of the planners’ best intentions. When the wall units in patient rooms were designed and built, narrow-bodied flat-screen televisions were not yet in vogue. So, all the cabinets were built deep to accommodate traditional bulky TVs. When it came time to purchase the televisions for the rooms, however, flat-screen had become the state-of-the-art. Now, the wafer-thin, rectangular sets float within the deep, squarish cabinets. The planning team knew from the outset of the project that it would face challenges such as these. “Building a hospital is going to take a lot longer than building a typical office building,” says Azar. Because medical technology advances so rapidly, it is necessary to anticipate change. Even then, “it often took longer than anticipated to select the equipment and do the design and engineering that was required for the installation of that equipment,” says Dr. Atkinson. The resulting delays, however, were often viewed as a necessary price to pay to stay on top of the latest technology. Even so, “at a certain point you have to say no more,” Atkinson says. Not that there is even the slightest disappointment with the technology that was put into place. Says Dr. Neil Martin, chief of the Department of Neurosurgery, of the new imaging unit: “This is really the embodiment of UCLA’s mission, which is to support research and teaching while providing excellent care.” He notes that advanced brain imaging has been a driving force in clinical neuroscience. The new equipment available at Ronald Reagan UCLA Medical Center “represents a quantum jump in the quality of brain-imaging and diagnostic and monitoring capabilities, and it enables us to define, at a molecular level, what’s going on in the brain in patients, so that we can identify new targets for therapy and design new treatments,” Martin asserts. Of course, it is only a matter of time before even the most-technologically cutting-edge equipment will become obsolete. That reality weighed heavily during the planning process, and decisions were made, whenever possible, to increase infrastructure to accommodate future needs. For example, Dr. Atkinson estimates that the IT data rooms are currently being used at only 30-40 percent of their capacity. 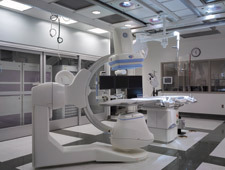 Extra-high ceilings on the interventional floor ensure there is room for the large pieces of equipment that are required, and the space within the ceilings was designed to allow ample flexibility to run additional utilities as necessary. On the building’s exterior, “zipper panels” can be removed to bring in sizable new pieces of equipment. The ICU rooms can all be used for minor procedures, and all of the non-ICU beds have the capacity to be used for ICU purposes.